Tractors are the main cause of accidental death on farms. 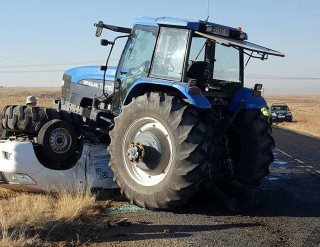 They are not only operated on farms and are also involved in crashes when travelling between farms and while sharing our roads with other road users. In South Africa only about 154,000 km’s of the road network of 750,000 km’s are tarred roads. There is a significant area of rural and farm land - a vast area where we find many tractors as an important farming and transport mechanism. Tractor crashes are preventable, yet almost 800 tractor related deaths are said to occur in the U.S. every year. We also found several examples of reported crashes/ accidents in South Africa as can be witnessed through the images in this article. We would like to offer some guidelines to employers and workers to improve and ensure the safety of those who use tractors on farms, and those who are in the vicinity of areas where tractors are being used. What is the nature of crashes and injury from the unsafe use of tractors? Tractors were neither built nor intended for joy riding. Farmers, farm workers and those living on or visiting farms have been killed or seriously injured in many ways. Being crushed when a tractor rolls sideways or backwards. Wrist, arm, hip, leg, and ankle injuries as a result of falling while mounting or dismounting the steps of the tractor. Injury while cleaning, servicing, adjusting, repairing, installing or removing an attachment. Driving at too high a speed / not maintaining a safe speed - Approximately one-fifth of accidents occur going to and from the field or work area. Unsafe operation of the tractor or fatigue on the side of the operator.  Pedestrian inattentiveness near tractors or slipping in front of tractors. Passengers riding along with no seat or place to hold on. Drivers misjudging slopes, ignoring changing ground conditions and forgetting the effect of loads on stability. Failure to Obey the Rules of the Road. Other vehicles crashing into slow moving tractors driving at sunset / night where tractors are not clearly visible. Stepping over and getting entangled in the tractor power take-off [PTO]. 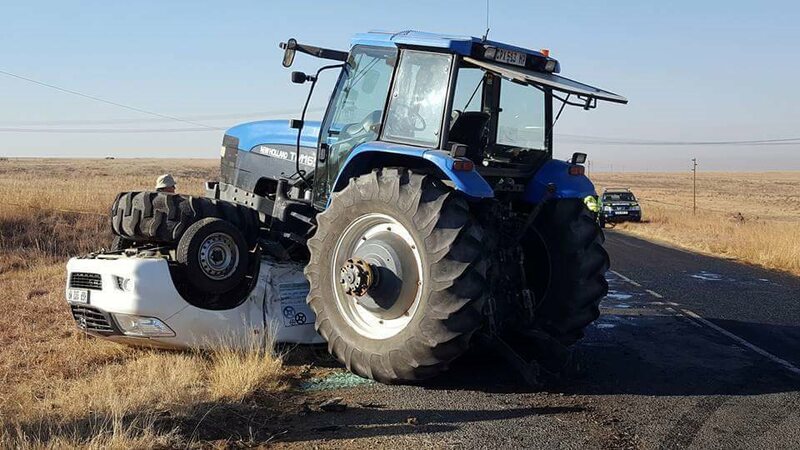 Although tractors were not made for public roads, there are times when such travel between farms and along and across public roads cannot be avoided. We share the roads with many other road users and we need to remain vigilant and focused on more than our own safety. We must exhibit extreme caution, courtesy and attention to other motorists and their passengers. Tractors and heavy machinery are so much larger than the average automobile; it’s important for farmers to drive defensively and keep the safety of others as their top priority. Before travelling on public roads conduct a pre-ride inspection on the tractor and any implements you may be towing. Make sure you have plenty of fuel and that the vehicle is fully roadworthy. Avoid driving on public roads during rush hours, bad weather, and at night. The best rule is simply not to drive on any public road at night. If it becomes necessary, however, be sure you are completely in compliance with the laws regarding lights. Driving on public roads should be done in the daytime if at all possible, and during the lightest traffic hours. If necessary, have pilot cars accompany you on the trip, one in front and one in back, with their hazard lights on to warn other motorists they are accompanying a slow-moving vehicle. Equipment, loads, bad weather or bright sunshine make it harder to see, so take care. Be sure to be familiar with and to comply with local regulations / rules of the road. Establish what is needed in terms of a “slow moving vehicle” emblem, proper clearance flags, lights and warning signals. Safe driving on the road is a must, and a safe driver is a courteous driver. Be aware of a build-up of traffic behind you when travelling; always look in your mirrors to be aware of your surroundings. If a considerable amount of traffic has built up behind you, pull off at the next available area, and allow the traffic to pass before pulling back on to the road. Be extremely careful at intersections. Watch your speed. 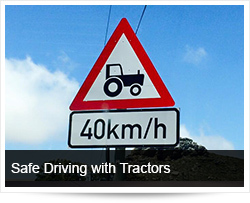 A tractor is designed for easy manoeuvrability at low speeds, not high speeds. Keep both hands on the steering wheel and your eyes on the road ahead. Keep in mind that a tractor’s steering reacts quickly, especially at high speeds. An accidental pull on the wheel can spin you into a ditch or into the path of oncoming traffic in a second’s time. Stay off the shoulders. If you must drive on the shoulder, cut your speed and keep a sharp eye out for rocks, holes, soft spots and other hazards. Never drive with one wheel on the roadbed and the other on the shoulder. Watch for rear-end swing when travelling with long implements such as ploughs. A child or unseen adult in the vicinity of the tractor is at risk of being run over. The operator must be sure the area is clear before moving the tractor. Keep all children off of and away from your tractor and its implements at all times. Children should not be permitted to play in the area where tractors and other machinery are operating. Get help if visibility is reduced, especially when reversing. 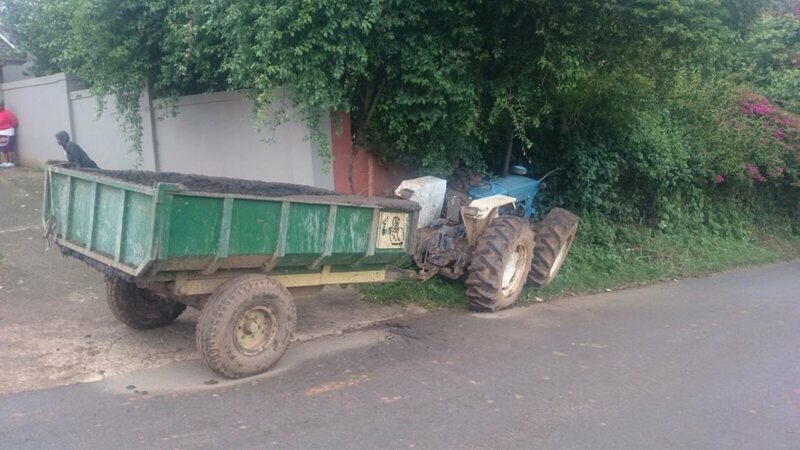 When reversing, use mirrors and horns and any other reversing aids fitted to the tractor. Check for bystanders before starting tractors or machines. Check where assistants are working and make sure you can see them. Only carry someone else if a proper passenger seat is fitted. Always read and follow safety procedures in the manufacturer's manual. Be careful in selecting your tractor operators - Ensure that they are well trained for each type of tractor work. Be sure your operators read and understand the manual, are familiar with the tractor and are fully aware of their responsibilities. Never use a machine unless you are trained and know how to use it safely. Never use a machine unless it is properly maintained. Keep an up to date maintenance schedule. Wear the correct clothes and footwear to safely operate the tractor - think safety before fashion. Wear clothes that will not snag on machinery, boots that offer grip and remove all jewellery. Well fitted, belted clothing is a must. Flared pants, shirt tails, scarves and other loose clothing are too easily (and too often) caught in moving parts or controls. Invest in quality safety work shoes or boots with non-skid soles and steel toe caps. Tractors are designed with safety in mind - these safety designs will however only help if they are used! Safe owner/operators need to add safety updates to machinery as they become available. These include tractor stability, visibility, and recognition, tractor safety decals, operator comfort and control, and protection from other hazards. People who operate smaller tractors without a cabin are at greater risk of injury or death from a tractor rollover. Ensure where possible that an approved cab or roll-over protective structure (ROPS) is fitted. Wear there is a roll-over protective structure also wear the seatbelts and adjust seats properly - Can you operate all controls comfortably? When wearing a seat belt, double-check that you can still see clearly. A seat belt will prevent you being thrown out of the cab in an overturn or road accident, where you are most likely to be killed or injured. Wear a seat belt when driving on slopes, silage clamps, working on ditch sides and when on public roads. Outfit your equipment with a fire extinguisher, flares, a first aid kit and small tool kit for minor repairs. Don’t neglect maintenance - Guided by your operator’s manual, set up a daily maintenance routine and put it on a checklist sheet for daily use. Tractor operators need to make sure they are safe while repairing and maintaining equipment. Check hydraulic oil, engine oil and fluid levels, radiator coolant level, brakes and brake fluid, tyre pressure, and fan belts. Make sure implements are secure and properly connected. Check, carefully, for hydraulic leaks, using a piece of cardboard or wood rather than your hands. Never fuel your tractor while it is running or hot. Turn off the engine and let it cool. Wipe off the area around the fuel cap both before and after fuelling. Keep safety signs clean and free from obstructing material. Clean them with soap and water followed by drying with cloth. Replace damaged or missing safety signs with new ones from your tractor dealer. Before carrying out adjustments ensure the tractor is in safe stop. Make sure mirrors are properly adjusted. Make sure mirrors and windows are clean and allow for full visibility. Don’t start the engine while standing on the ground alongside the tractor. You must be firmly seated, seat belt adjusted (if your tractor is equipped with ROPS), parking brake on, clutch pedal fully depressed, all controls in neutral, immediate area clear of children, pets and livestock. Remember - No Riders—There is only one seat on a tractor—the operator’s. There is no safe place for anyone else, especially a child, either on the tractor itself or on any of its implements. When getting in and out of the tractor - Always use access steps and handholds. Don’t jump from the cab. Use the nearside cab door whenever you can. Keep floors, doors, pedals and your boots clean and mud-free. Do not keep tools, drawbar pins or top links on the cab floor. Before leaving the seat follow safe stop procedures. Get out facing inwards so that you have a good grip. Never get on or off a moving tractor. Never be in a hurry about anything to do with your tractor. Take your time and do it right. Drive at speeds slow enough to retain control and respond to unexpected events. Reduce speed before turning or applying brakes. Watch out for ditches, logs, rocks, depressions, and embankments. On steep slopes, without a trailed implement, reverse up for greater safety. Engage the clutch gently at all times, especially when going uphill or towing. Use as wide a wheel track as possible on hillsides and sloping ground. Descend down slopes cautiously in low gear, using the motor as a brake. Take short breaks regularly when working long hours. When having tea or lunch breaks, stop and get off the tractor for a break, don’t eat and drive on the run. Never jump off a moving tractor or leave it with its engine running. A runaway tractor can be extremely dangerous. 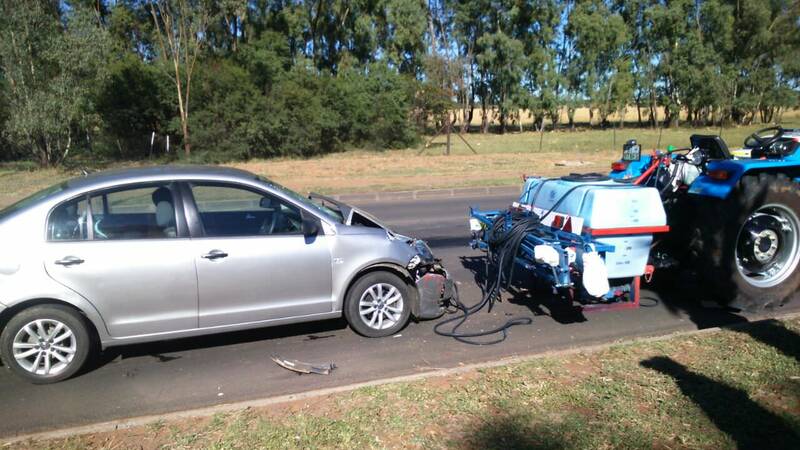 Be extra cautious when towing trailers and implements - even more so when trailers may be carrying passengers. Always fit attachments/ implements according to the manufacturer's instructions. Always attach implements to the draw bar or the mounting points provided by the manufacturer. Regularly check safety pins on towed lift-wing implements to ensure they are not worn. Keep your hitches low and always on the drawbar. Otherwise your tractor might flip over backwards. Using tractors and trailers without an adequate braking system has led to loss of control, jack-knifing and tractor-overturning incidents. Tractors and trailers used on or off the road need to stop safely within a reasonable distance under all conditions. Inadequate trailer brakes can lead to accidents when manoeuvring on slopes or slippery surfaces, as the tractor may be pushed sideways and slide out of control. Safe towing requires the use of a large enough tractor and selecting the most suitable gear to stop the combination within a safe distance. Make sure you buy trailers that have a suitable braking system to match your tractor and ask the supplier for brake efficiency information. Failsafe trailer braking provides emergency brakes if the tractor stalls, or if the tractor and trailer become unintentionally detached. Tractors are not made to play with but to work - Much of this might be done in challenging terrain! Be familiar with your terrain and drive safely. Use caution on slopes, slow down for all turns. Most tractor accidents are overturns (mostly sideways). They are usually caused by high speed or inattention. Remember that rollover / overturning can happen on flat ground as well as on slopes. In the event of an overturn stay in the cab - do not attempt to jump out. Sideways rollover and backflips account for most of all rollovers. Sideways rollovers occur most commonly when traversing a steep slope or cornering too sharply at speed. To understand the sideways rollover, we need to understand the relationship between the tipping axis of the tractor and its centre of gravity together with the amount of centrifugal force developed during cornering. The tipping axis is the line that a tractor will pivot about during tipping if driven over a steep enough slope. 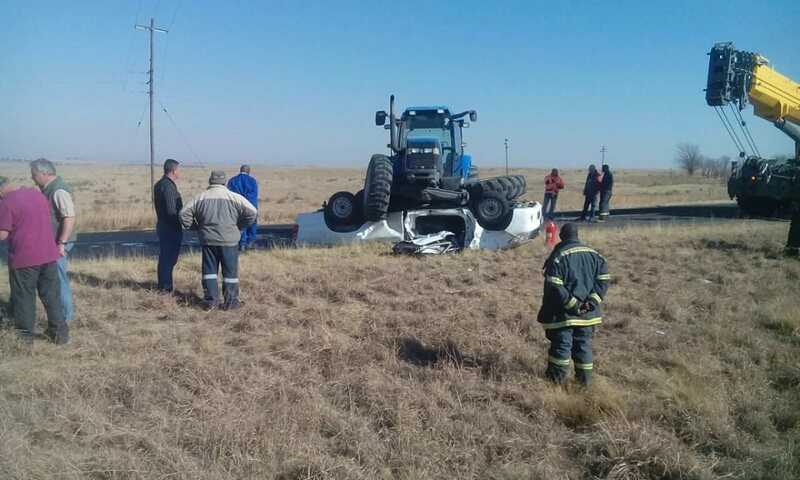 Once the centre of gravity, usually located in the vicinity of the gearbox in the midline of the tractor, lies outside the tipping axis, a rollover is inevitable. Gravity and centrifugal force are the two major forces involved in a sideways rollover. Centrifugal force is introduced when a tractor is cornering. This force tends to pivot the tractor on its outside wheels during cornering. This predisposes the tractor to roll over. Back flips are produced through rear axle torque and drawbar leverage. If axle rotation is prevented as in the case where the tyres are stuck (e.g. if bogged, frozen to the ground or if the load is very heavy), the rotational force moves the tractor backwards around the rear axle, lifting the front wheels off the ground and a backflip can result. Drawbar leverage describes the force which tends to pull the tractor rearwards when it is towing or pulling an object. The magnitude and its effect on tractor stability will vary according to a number of factors including the weight, draft, hitching point used, resistance to movement and angle of pull. 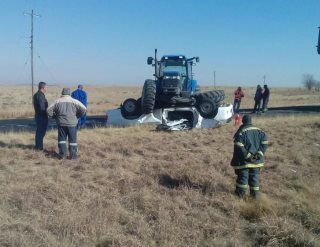 Driving on narrow or raised tracks or roads poses a risk of the tractor rolling over embankments and injury to the operator. Avoid working across slopes if your tractor has large diameter, tubeless, low ground-pressure tyres. Use caution on slopes and uneven ground. Drive at a speed slow enough to keep you in complete control of the tractor at all times. If there is not enough room for a gradual turn, use a slow three-point turn. Don’t depress the clutch pedal or attempt to shift gears while going down a slope. And if you have to go up a slope, it is best to back up. Make sure that your tractor is properly counterbalanced. Although a tractor can be driven up a slope with a hard surface, it cannot necessarily come down the same slope safely. Add front end weights to a tractor pulling a heavy load up a hill when working on mild slopes. Always descend straight down the gentlest possible gradient of a slope, rather than driving diagonally across it. Avoid turning down a slope - this is especially hazardous. Plan work across slopes so that turns are made uphill rather than downhill. Use the widest practicable wheel track setting to reduce the likelihood of the tractor overturning. Do not park with a heavy load on a steep slope - Try to park on level ground, especially when loading and unloading. In rainy weather, stay alert for holes or ditches hidden under water. Cut your speed to the minimum. In icy conditions, use extreme caution. Use tire chains and wheel weights. Again, drive at a speed slow enough to keep you in complete control of the tractor at all times. If in doubt, walk the ground before driving over it to check for hollows, hidden logs, tree stumps, rock outcrops, rabbit holes etc. Drive slowly where the ground surface is not easily seen, e.g. in long grass, large ferns etc. 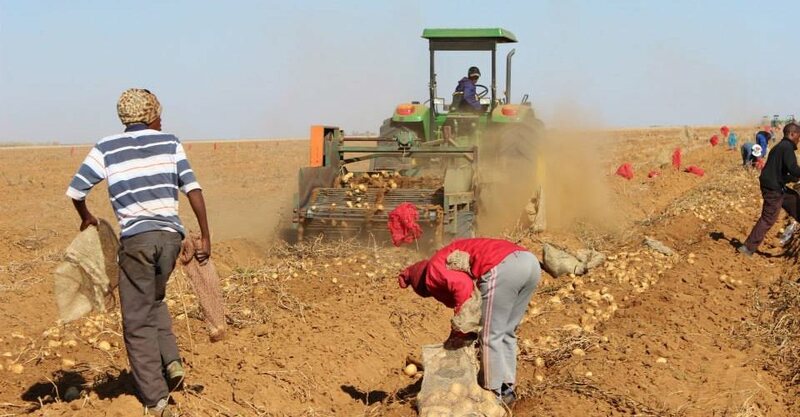 It is important that owners of farms and their workers cooperate closely to ensure the safety of all working with tractors and those in the vicinity of these operations. An informed road user / worker is a safer worker. Information should be shared with workers, they should be given the opportunity to express their views and their views should be taken into consideration. Safety hazards must be identified in a systematic way. Farm owners, managers and workers must identify those jobs and situations on the farm that may cause injury or illness not only to people doing the work, but also to bystanders. Reports could be on any unsafe condition, or unsafe tasks identified and action must be taken to make it safe. A plan of action must be developed which outlines how the risk of injury or illness from the hazard will be minimised. Attention should be given to “worst case scenarios” to ensure everyone knows exactly what to do in the event of an unfortunate injury to a fellow worker.